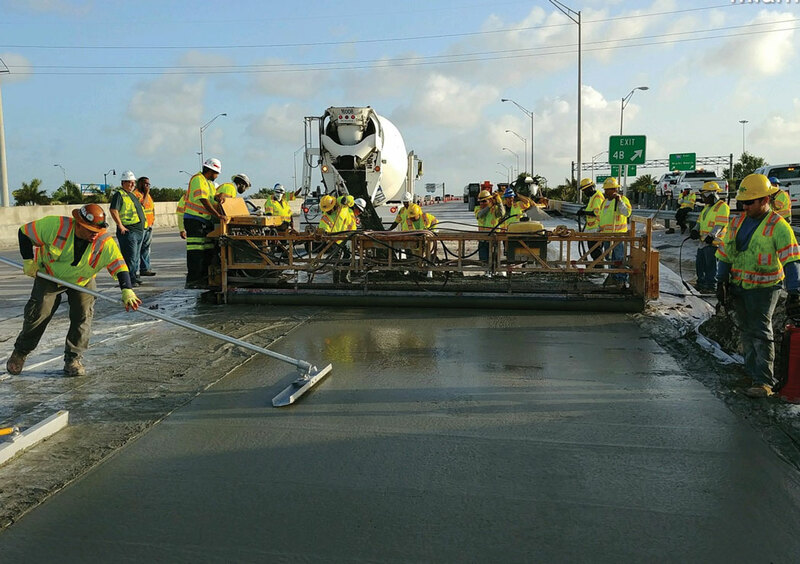 The Florida Department of Transportation expects to complete four of its five major Miami-Dade roadway projects in 2018. The five include major improvements for the Palmetto Expressway, I-95, Southwest 107th Avenue, Flagler Street and downtown. The Palmetto Express project ($244 million) establishes new express lanes that stretch for 28 miles south of the Dolphin Expressway in Miami-Dade to I-595 in Broward County. The department’s District Six oversees almost 10 miles from West Flagler Street to Northwest 154th Street and three miles from the Palmetto Expressway to Northwest 170th Street. The project launched in spring 2014 and the department says it will complete it by March. I-95 Rehabilitation or the I-95 Emergency Stopping Site and Concrete Replacement Project ($89.5 million) includes improvements from Northwest 29th to 131st streets. The project receives federal and state funds. The project, which began in February, was delayed by Hurricane Irma. Mr. Gonzalez said, “Special events and adverse weather conditions including Hurricane Irma have impacted the project schedule. The [emergency stopping sites] contract end date has been pushed to April 2018. The concrete pavement project is expected for the summer of 2020.” The final project should improve driver safety. Southwest 107th Avenue ($18.2 million) primarily improves congestion and safety conditions for pedestrians. The department depends on federal and state funds for the projects. The additions widen corridors from four to six lanes, adds bike lanes, replaces a four-lane bridge across the Tamiami Canal with six lanes and dual left-turn lanes onto Southwest Eighth Street. The state transportation department also is partnering with Miami-Dade County to replace the existing 8-inch water main lines with a new 16-inch ductile iron pipe. The project is about 70% complete and, at the moment, focuses on improvements along the east side of the corridor. Mr. Fung said that in the next two months the department will continue to improve the east side. “These improvements will include the completion of the new sidewalk, new bridge over the Tamiami canal and the installation of the new lighting system and signalization components,” he said. The Flagler Street Reconstruction and downtown projects ($14.24 million) utilize county, state and federal funds and rely on a Joint Partnership Agreement with the Miami-Dade Water & Sewer Department. The West Flagler project focuses on replacing the stormwater drainage system, installing new sidewalks and pedestrian signals, adding exclusive shared-use bicycle lanes and reconstructing roadways. The transportation department also is replacing a water main that dates back to 1943. The project includes work within the area from West Flagler Street from 27th to 14th avenues, to be completed in the spring, as well as Southwest/Northwest 27th Avenue from Southwest 10th to Northwest Ninth streets, to be done by the summer. The projects have been hit by delays since commencing in spring 2016. Downtown ($3.49 million) plans include Southeast Second Avenue and Biscayne Boulevard. The state works with the Miami-Dade Water & Sewer Department on another Joint Participation Agreement. The state will repave roadways, install a pedestrian refuge island on the I-95 entrance ramp and update sidewalks on Southeast Second Avenue. Tasks along Biscayne Boulevard include repaving the roadway, updating the stormwater drainage, extending the bicycle lane from Southeast Third Avenue to Southeast Third Street and installing a shared-use lane from Southeast Third to Southeast Second streets. The project utilizes county, state and federal funds. The plan began in July and should be finished by June. Mr. Duarte said the state team currently is working to install a stormwater drainage system along Biscayne Boulevard and is modifying the traffic separator along Southeast Second Street.